Illinois State celebrated Phil Shaw at the Center for the Performing Arts in August. Alumni, friends, and members of the community gathered August 24 in the Center for the Performing Arts to celebrate the life of Illinois State University alumnus Philip Shaw, who passed away last February at the age of 65. Shaw had been a major presence on stage and behind the scenes in theatre at Illinois State and around the community. “We are all of us profoundly fortunate to have had the opportunity to live, work, and love Phil Shaw: I once told him that I felt torn and embarrassed that our culture hadn’t known how to celebrate him. He was a brilliant thinker whose work had the intellectual sincerity and power of most theatre professors I’ve worked with; his work in the rehearsal and performance halls was brilliant; and his love for us was impressive. “As a young theatre major in the early to mid 1970s, I remember that Phil was already a fixture at the school. I remember his voice, his talent, his humor, his presence, his music, his quiet strength, his beautiful hair, the way he was quick to laugh, and most of all, his big heart. I am so glad that I got to see him again in October of 2012 when he, and I, and Nancy Laluntus, and Cal Pritner and a few other people returned to ISU to work on the Theatre Department archives. We sat pouring over programs and photos from productions long ago, back in the 1970s, and in flailing flashbacks our aging brains would recognize someone, and shout out their name. “Ooh, ooh that’s Bob Romeo. Ooh, ooh that’s Kent Monken! Oh my God, is that Ralph Lane?! ?” It was a lot of fun. And Phil hadn’t changed. He was still the same Phil. “Phil Shaw was my colleague, student and friend. I was aware of Phil’s acting skills before my affiliation with Illinois State Theatre. When my wife, Carol and I visited Ralph and Ronnie Lane while we were on the faculty at Carthage College, we saw Phil on stage. 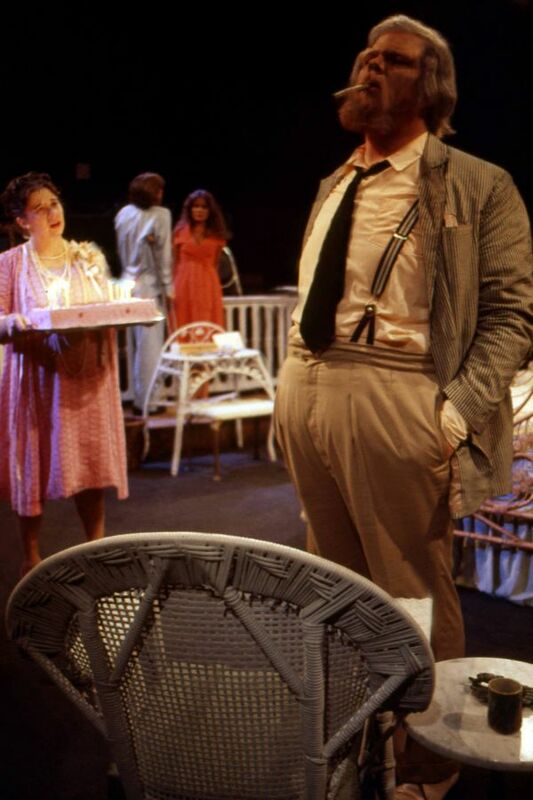 Later when I was a graduate student in design, Phil was remarkable in a production of The Three Penny Opera in the 1970’s. He was a composer for productions I designed that year. It was always good to have Phil at the table for production conferences. Later when I was on faculty at ISU, he was enrolled as a graduate student and took my design course. Whenever I couldn’t remember the title of a script but would reference a moment from a play to make a point about “designing for the script and characters,” Phil would just say the title and the playwright quietly in his deep voice and we moved on. One of my most rewarding experiences was when Phil played Lear in the Road Warrior version of King Lear directed by Tim Erwin of Steppenwolf Theatre. Phil’s work that summer for The Illinois Shakespeare Festival was exciting to behold. He enhanced my design. His dedication to any project he took on and his shear love of theatre is a model for all people of the theatre to remember. “Even though I hadn’t seen Phil for years, I remember him fondly. He always seemed such a sweet, gentle soul with a magnificent voice and incredible talent. He was a lovely actor to work with—generous and inventive. And a lovely man—shy and unassuming. I will always remember his ready laugh. I find it interesting that the two roles I remember him most for were far from sweet or gentle, but were very complicated and tortured men: Simon Stimson, the minister and town drunk of Our Town, who found the provincial nature of Grover’s Corner stifling, and used alcohol and suicide as escapes; and Goldberg, the menacing henchman in The Birthday Party, who was sinister, and sarcastic and funny. “I have been struggling for the longest time, racking my brain for a funny antidote or magical moment that would encapsulate my feelings toward Phil and what his presence in my life has meant to me. I can’t think of one. My brain doesn’t work that way, and Phil’s influence on me is impossible to reduce to one story or epiphany. Phil is one of those beautiful souls who personified wisdom and generosity. He was exemplary in the way he carried himself as an artist and a human being. He altered my future and inspired a purpose. That gift still lives inside me. At the absolutely impressionable age of 18, I met Philip. Not before or since have I had the pleasure of experiencing such a dedicated insightful scholar intertwined with such a passionate and gifted performer. Philip could, somehow, magically exude deep dark biting wit and soaring gentleness. I imagine that I am just one of hundreds of classmates and teachers who feel deeply grateful to have felt his unique light. “In the summer of 1975, I took my first steps to becoming an actor. The reason is that for four weeks I took the stage with an actor who was superb in every conceivable way. He had a voice that could chill you to the bone, and an emotional depth which could leave you devastated. The play was Cat on a Hot Tin Roof. I believe I fell in love with acting that summer because of my experience working opposite this actor. I was 18 years old, and had enjoyed performing up to that point. But this launched me into another dimension. I’m not sure who was more moved by his performance, the small audience in the old Allen Theater, or myself who also happened to be onstage. He awakened something in me that I cannot describe. But I suspect it was a standard that I have tried to maintain to this day. To empty the tank, to leave it all on the table. And I am certain it is one of the reasons I am still in this business today. That actor was Phil. I love you my friend. I hope you have found peace. And if I could, I want to say to you one last time. I was honored to have had the privilege of working with Phil as a director of shows for both Community Players and Miller Park Summer Theatre. He directed me in "Jesus Christ Superstar" for Players, and in "Big: The Musical", "Carousel", "The Sound of Music", and "Annie Get Your Gun" for Miller Park. I also enjoyed singing and performing with him at State Farm's "Sounds of Christmas" where he always sang "Amazing Grace/O Holy Night". I believe his dear friend Sally Gowdy was the arranger of that piece. My group, the Sound of Illinois Barbershop Chorus, still performs there each December. This next one I am going to dedicate to Phil. I also recently played Harold Hill in "The Music Man" for BCPA's Miller Park Summer Theatre. I dedicated that show to him as well since it was one of his favorite musicals. Phil always had such an artistic and elaborate vision to every show he directed, every role he played, every set he designed, and every person he worked with. His sense of humor in rehearsals was always great, and he could burst out laughing when a piece of dialogue or they way the person delivered it was funny. He would always tell you when something was either too much, not enough, or just right. That is how a director should be! Phil, may your spirit live on and may current theater generations be inspired by you! This was an incredible event and one that I will never forget!